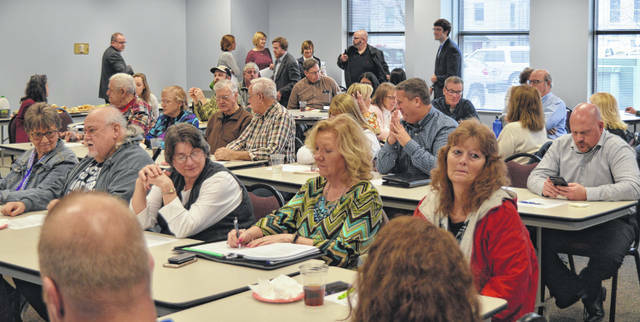 Organizers were pleased with the turnout at the initial meeting for a 2019 Clinton County Coordinated Public Transportation Plan. At the first planning meeting are, from left, Highland County Mobility Manager Joe Adray, Fayette County Mobility Manager Mekia Rhoades, and Clinton County Regional Planning Commission Associate Director Stephen Crouch. 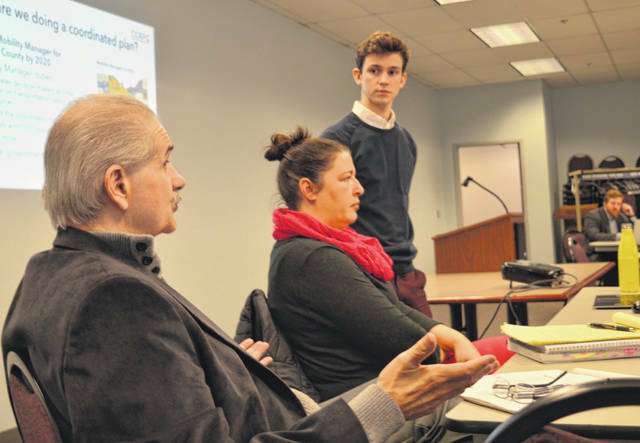 WILMINGTON — There are several reasons to put together a coordinated public transportation plan, the associate director of the Clinton County Regional Planning Commission (RPC) told a bigger-than-expected turnout at the first meeting. Those reasons include “serious service gaps” that exist especially for senior citizens living outside Wilmington; in order to become eligible to hire a mobility manager here to help address unmet transportation needs; and to become part of the majority of Ohio counties that already have such a plan, said RPC Associate Director Stephen Crouch. Clinton County RPC Executive Director Taylor Stuckert said his office’s recent survey and subsequent report on aging in the county — in which rural transportation was identified as one of the larger issues facing local senior citizens — was a springboard to the effort to develop a coordinated public transit-human services transportation plan. But in talking with local employers and other agencies, there is “a broader need” for transportation in the county, said Stuckert. As a result, the RPC wants the coordinated public transportation plan to be “comprehensive” and look at what the needs are county-wide as a whole, he added. Accordingly, RPC hopes many Clinton Countians will complete a transportation needs survey that’s now available online on the Facebook page of Energize Clinton County and on the RPC website at clintoncountyrpc.org . The community survey will close in less than a month, on Tuesday, March 5. The Clinton County Transportation Needs Survey will be used to better understand gaps and unmet transportation needs in the county. All responses are anonymous and will be used in the 2019 Clinton County Transportation Plan. During the initial planning meeting this week, Crouch said the goal is to hire a mobility manager for Clinton County by 2020, hopefully in January 2020. The federal government funds 80 percent of a mobility manager position. The mobility managers for Highland County and for Fayette County attended the meeting. Highland County Mobility Manager Joe Adray said the position among other things acts as a liaison between the Ohio Department of Transportation (ODOT) and the community regarding programs to increase transportation availability while also being involved in solutions. ODOT requires that older adults and people with disabilities be involved in every stage of the coordinated transportation plan process, said Crouch. At one point, Stuckert said planning committee participants probably could include more local employers.